Thank you for hanging in there with us as we navigate this new path of hospitals, new medical discussions and rhino virus. It is a couple days after Christmas and I am sitting in the dark of our hotel hospital room while Everly sleeps. So, all you problem solvers out there probably picked up on the fact that means, yes, we did spend the holidays in here. While it would have been nice to have our annual Christmas Eve appetizer and dessert buffet at our house, we were and still are glad that we have our Sweet Pea...no matter where we are! So, since we couldn't go to our Christmas festivities, the Christmas festivities came to her! That actually began with our visit from Santa just a couple days before this present hospitalization. One of Santa's elves contacted me in mid-December because they knew that it was not a possibility for us to take Everly into the mall to visit Santa. Our bubble has to be our home so we arranged a visit to the house. I told the kids he was heading our way and Kendan literally was unable to control his excitement! He paced back and forth at the front door, just waiting. Wearing our fancy dresses during Christmas time! Our visit with Santa was nothing short of pure MAGIC! From his warm disposition with the kids to his bringing and then playing the nose flute with the boys. I think Santa was as smitten with our sweet angel as we are! He held her, held her AND held her! She was just as smitten with him as she continued to stare at him with such intrigue. Santa told stories about various aspects of keeping the reindeer in "off season" and gave Everly an elf name. I thought Santa had to hurry home to finish working in the toy shop but, much to our surprise, he said he wasn't in any hurry. As he sat there just looking at Everly, she stared back at him and then just fell asleep in his arms. He stayed there and held that baby up in his arms while she slept for well over an hour without the slightest movement. The most special part of the visit was when Santa prayed in earnest over Everly. While still inpatient, my mom single-handedly orchestrated Christmas Eve tradition in the hospital! We had egg nog, cookies and appetizers in the room. (Thanks, Nana, for setting up the whole buffet in the room. I know it was a lot of STUFF to bring in just to turn around and lug it back home.) The boys watched A Christmas Story while we chatted and nibbled the evening away! The start of the Christmas Eve buffet! Christmas Day began with the boys and daddy toting all that Santa had left them at our house here to the hospital room. Nana and Papa met over here as well and we all shared in Everly's FIRST Christmas Day! She just sat back in her therapy chair in the center of the room and took in the chaos! She was very good this year because she received exactly what she asked for: Mary Jane style socks, a therapy exercise peanut in PINK and baby nail polish! Good job, E! 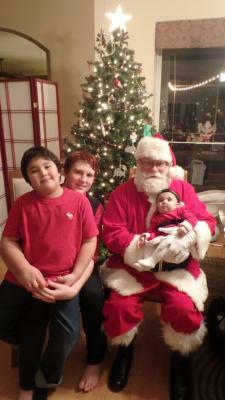 The boys were also good because they each received the three things they asked for from Santa and a few extras! That next day it was suggested that a sleep study be completed while inpatient so we could see if she had apnea which would answer the high CO2 retention (part of it anyway). So, that night she had a sleep study. On Monday, the pulmonologist came in early evening to tell us that she had over 100 apneic episodes during the course of the study. She most definitely could use and benefit from the CPAP. It could be life-saving with that number of spells happening! Trying to find something else to do. You Tube baby stuff to watch. So, in my naïveté, I thought that the CPAP machine was ordered and then delivered wham bam! Umm. Let me fix that misconception now. No, it isn't ordered in one day. No, it certainly isn't delivered it on one day. The truth is that it is COMPLICATED. 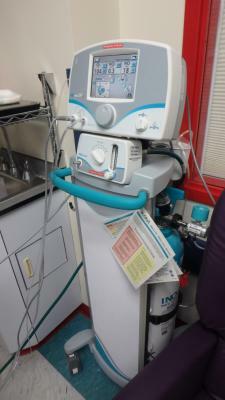 The machine is actually considered a ventilator and is treated as such. We won't be having it in that mode as we'll be doing CPT as well. Because it is considered a life-saving device, it is NOT something that can be acquired through our hospice contract since hospice is comfort care at the end only. So, that's pretty much where we are now. It has not been ordered as of yet due to a few other issues that will need to be addressed Monday. The approximate time frame we were given from the DME company we'll be using is a week at best to get the machine to us in the hospital. The biggest issue is that the insurance won't pay hospice for care AND also a DME for another piece of equipment since hospice is everything. Therefore, in order to get this machine, we will have to sever ties from hospice. I will, however, check on Monday to see if there's ANY other way around this but I've spoken to two case workers here who have experience in this situation. So, basically what this means is that we would have to give back ALL her machines, tanks of oxygen and who knows what else and depend on an outside company to supply Everly. I am hopeful that the transition that we are now forced to make will be for Everly's benefit. Everly herself is still sick. Well enough to go home but sick enough still that we will need to be extra vigilant. She is still very congested and has tons of drainage. The drainage is good except that it makes it hard for her to sleep and rest during he day. She is now on CPAP at night and that has given her better rest then. The mask and the pressure input are certainly new sensations that aren't necessarily pleasant and will take some getting use to, especially since the home one will be different anyway. I must say that her sleep the last few nights with the CPAP on her has been definitely helped her. Some hiccups with the mask placement and seal that keep coming up due to head position (babies move) and her NG tube leaving a tiny crack in the seal around her nose. We are both ready to come home and the boys are ready for us to be there, too. This lack of routine and consistency among other things wears on you. However, again I am reminded that we must stay so that she can get what she needs. I forgot to mention that the company must go through our house first for some inspection. Then when the machine is ready it needs to be brought to the hospital so that we can fix the settings and it can be monitored here for a night of sleep at least. So, those two components also add to our ability to take Everly home. If you're keeping track, we've spent my birthday (Feb for her birth), Thanksgiving, Christmas Eve, Christmas, and now New Year's Eve and New Year's Day all in the hospital. Thankfully we are surrounded by lots of fun, caring and helpful peeps working here to keep us motivated! We can do this! We're almost there!! Well/non-sick visitors are welcome, meals are also welcome. We are so reminded all the time about the blessings we seek and how God cares for each of His children. Now is no exception! P.S. 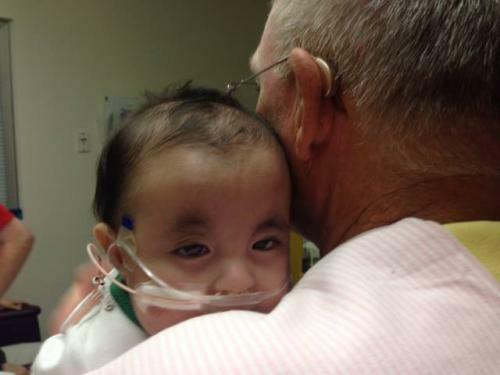 Prayers please for our Trisomy 18 friend Elisabeth as she was admitted into the PICU in Texas now as well. This congestion/cold no matter how small is very serious! She is resting comfortably now and we pray that she keeps that up so she can give it her all! Thank you all! This was within minutes of removing the high flow system. God is so good! Thank you all for praying in earnest for Everly! I repeat: she is OFF oxygen already! This morning on BIPAP still and tonight she is free! We most likely will need to give her a tiny amount--.2 or .3 probably--when she hits REM sleep only. Sunday morning: weaned to high flow early morning, then planned to wean to regular cannula but during the transition it was apparent that she no longer needed it, may use oxygen during REM sleep if heart rate sags any, started foods this morning and doing continuous and she's digesting it all. I continue to be amazed at God! He no doubt heard everyone lifting up Everly's name to him! What a blessing it is for our family to have all of you praying for her and just enveloping our family with love and support! I am just in shock and awe that this was all done today! But God can do it all and He did! Oh, how He loves His children! 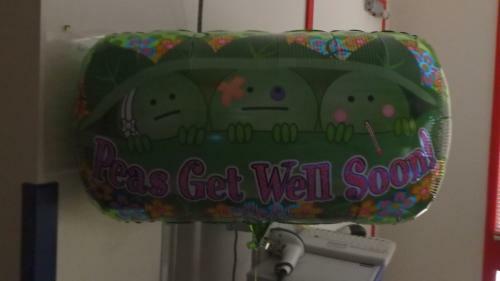 How perfect is this balloon!!! Dr. Niebauer!!! Our angel doctor! How we love you! It's probably sinful. Let me first start by saying that when we were initially hospitalized and then released, I was hoping to never have to revisit the hospital. Not because of the staff or St. Joe's in general but because it would mean that she needed to be in the hospital for some reason and that is what I wanted to avoid. But then I must remember that God's in charge, not me. 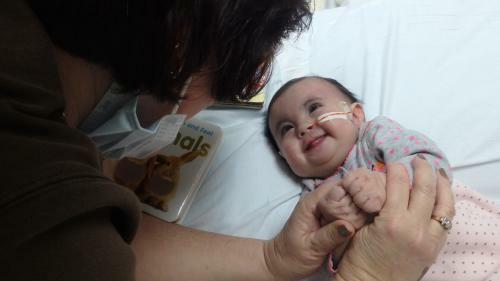 Being admitted twice has turned out to be the BEST thing that could have happened to her. It was His plan all along. Not only has God done that for us since we've been in the hospital, He's gone above and beyond to further my faith in His providence. I love this description of what providence is in relation to God: Providence, then, is the sovereign, divine superintendence of all things, guiding them toward their divinely predetermined end in a way that is consistent with their created nature, all to the glory and praise of God. This divine, sovereign, and benevolent control of all things by God is the underlying premise of everything that is taught in the Scriptures. Ever hear about God placing people in your path for His purposes? I know that every step of our journey has been just that...people placed in our path based on His plan...our us placed in their path for His plan. Most recently, our paths crossed with a doctor in the PCICU who in no uncertain terms has changed our lives and more importantly, bettered and, I'm positive, prolonged Everly's. Dr. Julia Niebauer is an angel. A real, doing-works-on-earth, angel. She is an out-of-the-box-kind of doctor. 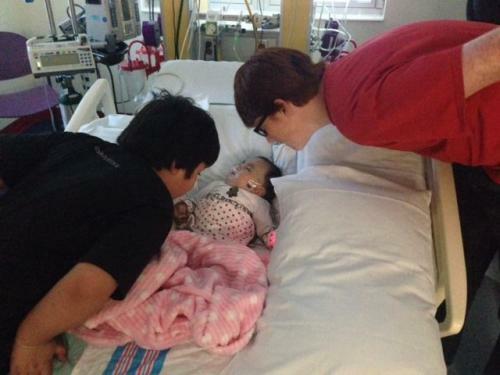 She didn't just treat Everly for the acute illness. No, ma'am. She looked over her chart, her labs, her history. Every single detail. Then she leapt into action. And I mean literally 0-60 in 5 seconds! To try to give a play by play of the last two weeks, this would turn into a small book. So, instead, I will just cover the highlights. Everly's Feeds/Weight: Dr. Niebaur inquired about her feeds and the fact that she wasn't consuming enough calories. I was taken aback that she had noticed because I have felt that for the last two months and even went to our GI to address this. She also asked if we had ever tried continuous feeds (feed running continuously for a period of time). I responded no but I was open to any changes, especially when it will help her to gain. So, literally that night she started continuous feeds from 8pm - 8am. Everly's body did well with the change. From there, Dr. Niebaur continued to tweak her feeds, both timing and volume, until currently she is at the optimum schedule. Prior to the changes, Everly would eat every three hours over the course of an hour and fifteen minutes...around the clock. Each time, the process was the same: check placement, residual, heat food, clean food bag if pump feeding, if not, then process was longer because we would feed her with syringes (bolus feed) by hand over that hour time frame. Now she eats at 11 am, 2 pm, 5 pm over a half hour period and then has continuous slow feeds over a longer period of time (12 hours) all via the pump. Plus, this allows her to receive more volume (=more calories=more weight gain) overnight. Yay! I'm normally not one to embrace change but this is one I'm digging! 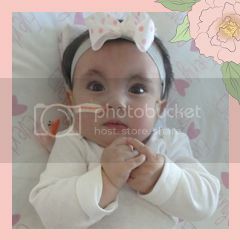 Oh, AND, Everly gained a whole pound while in the hospital over 2 weeks!! Currently 12 lbs 8 oz! Everly's Meds: Another positive change that was made...ditching the caffeine that Everly has been getting since NICU! She received it because of her central apnea. However, while we were in the hospital, angel Dr. Niebaur asked why she was taking it. After we told her, she said that they hadn't recorded any apneic spells while there since they monitor her 24/7. She stated that it is possible to outgrow this apnea and would we be game to try to titrate her off the caffeine. You betcha! The least amount of meds, the better, I say! So, that we began the process the very next morning. Within days, Everly was completely off of the caffeine...had to go slow due to side effect of possible headaches (you know how you feel during a caffeine withdrawal!). Praise God for this step! 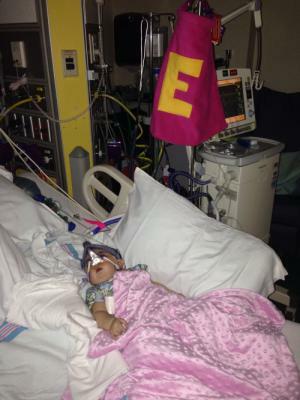 Everly's NG Tube: Another concern, angel Dr. Niebaur had was of Everly's NG tube. She at first was worried that she may have been silently aspirating and that was part of the reason she had pneumonia from continued build up in her lungs. She consulted with Dr. Pham and he came to see us and together we came up with a plan. We would take her to nuclear medicine for a silent aspiration test to see if she was or was not having this issue. If she was, then step one would be to replace her NG tube that runs to her stomach with a longer one that would go lower and not allow the silent aspiration. The problem with this solution for us is that the tube can only be reinserted in the hospital not at home how we'd been doing it. Also, when it came time for a G tube surgery, she would need an additional procedure and a different kind of tube set up which is not what we felt was ideal. However, following the test, we found that she in fact does NOT silently aspirate so the NG can stay as is and there would not be any other kind of G tube needed. Another praise report! Everly's Immune System: Well, we already knew she was medically fragile and ridiculously susceptible to illness. While inpatient, we also learned just HOW fragile her immune system truly is at this point. Dr. Bash, our hospice doctor, had her system tested to see what her antibody levels were overall. Found that she has something called Hypogammaglobulinemia which means that she has an abnormally low level of immunoglobulins (antibodies also called proteins that help fight infections). The thought is that she has more specifically Transient Hypogammaglobulinemia of Infancy which means she would grow out of this between the ages of 2-5 normally. Basically what this means is that to protect herself she requires an IV infusion of antibodies in the hospital or immunology office every 3-4 weeks. So, the poor baby has to get an IV each time and the infusion lasts between 2 to 6 hours, depending on how she can handle it. 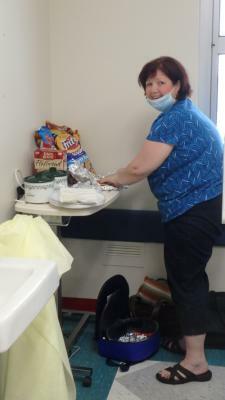 She received her first infusion inpatient at St. Joe's the night the blood test came back. They wanted to protect her right away. Everly's Heart: Her sweet, tiny heart. Well, where to begin really. I have posted before that she has a very large VSD and that her lung pressures have been balanced since birth. She's had pulmonary hypertension since birth and since it's a progressive disease, it will only get worse with age. Once she got this Rhinovirus, it seemingly has altered that balance ever so slightly. The doctors felt like this was the right time to test her reactivity to a vasodilator like nitric oxide. "Vasodilators are medications that open (dilate) blood vessels. They work directly on the muscles in the walls of your arteries, preventing the muscles from tightening and the walls from narrowing. As a result, blood flows more easily through your arteries, your heart doesn't have to pump as hard and your blood pressure is reduced." If her body had not reacted--her SAT's quickly rising to mid-90's--then we would know her body had passed the window of opportunity to use these medications. The pulmonary hypertension would have been considered irreversible at that point. Note: if a person's body is found to be reactive still and they use the vasodilators, it does not mean that the PH will never come back just that it can be managed. Well, the good and exciting news for us it that her body was still reactive to the nitric oxide! And immediately! So, cardio started her on Sildenafil, liquid Viagra, and the oral version of nitric oxide. FYI: Viagra was first used and made for this purpose. The "other" was found to be a side effect and marketed to that population after the fact. This dosing of Sildenafil will help to manage this PH until further plans are made to investigate further the option of heart repair. 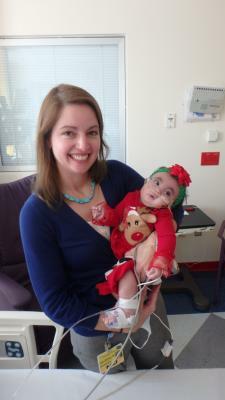 One of the most exciting things to happen during our stay was a pow pow that occurred among a small group of physicians regarding Everly's future heart repair plans. I told them as we began our stay that our goal is to repair her heart to the extent that it is a feasible and logical option for Everly, not just because a surgeon can do it. Following that meeting, our cardio--the one we've had since NICU--came in and after a long day for her in clinic and then a heavy, medicalese-laden conversation, told us that she would do the heart catherization needed to see if open-heart surgery (repair) was an option. 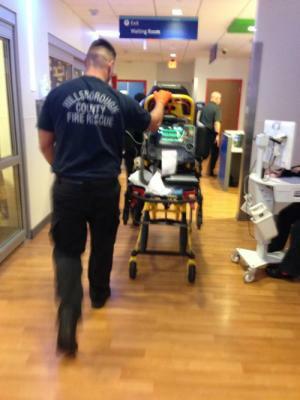 Simply this: Cardio had told us from day 1 that a heart catherization was not an option for patients with Trisomy 18. Bigger than that, without this procedure that measures all sorts of complicated vitals heart-related, heart surgery is not even on the table. This, my friends, is A BIG DEAL!!! So, here's the part that is important to remember: just because a procedure--like open heart surgery--can be done, doesn't always mean it should. For example: trying to repair her heart with the balance that she's had over her life would most likely kill her. Why? Well, it's complicated but trust me, not an option. Herein lies the necessity of this heart catherization. "It is a surgical procedure used to evaluate heart function and diagnose cardiovascular conditions. During cardiac catheterization, a long narrow tube called a catheter is inserted in an artery or vein in your groin, neck, or arm. This catheter is threaded through your blood vessel until it reaches your heart. A dye can be injected through the catheter to allow the doctor to look at the vessels and chambers of the heart with the use of a special x-ray machine. Once the catheter is in place, doctors can use it to run diagnostic tests." Basically, this can help the cardiologist to determine the value and benefit of heart surgery. Our nighttime gal pal, Laura! Always a smile and even Everly is amused! She's on it and even thinks of things we don't! The heart is complicated and one change affects something else. So, for example, the concern that we have for Everly still needing O2 is that because of it being a vasodilator, it will hasten the change in balance she currently has. If she is preparing to go into surgery for her heart repair, then this is what is needed and the protocol would be for her to be on continuous 02 and a med like Sildenafil. However, if she is not heading into that scenario, the concern would be altering an otherwise "stable" balance that is allowing her to have the kind of life she has without aggressive intervention. So the next BIG news...is...are you ready??? There is an amazing surgeon who has agreed to do Everly's heart repair here at St. Joe's if it comes to that!!! God put the right people in place at the right time with the right heart. That is all I can say. This is AMAZING! Even if heart repair is not an option physiology wise, I will always know that someone deemed MY child's life AS VALUABLE AS ANYONE ELSE. I am humbled and so grateful. God is SO good. NEXT STEPS: As for our next steps, the plan is to schedule the g tube surgery as she's approaching the year mark. Next, depending on we feel with the response her body has to anesthesia and the like, we will then schedule the heart catherization. Following that, we will have to wait and see the results from the heart cath to see what should be the appropriate next steps. By the way, we are not going to have the malrotation of the intestines corrected at this time. People can survive without that fix for quite some time; you just need to be aware of the danger signs. **Note: I believe due to the nasty germ season we are currenly in, we may wait until spring to schedule the surgery. Right now, germies are everywhere and are dangerous, especially in the hospital so if we can avoid it during this time, all the better! Love Kathy! She's always cheerful and wanting to know how she can help you! A doll!! Other: Everly is just so special to all of us! She has these piercing eyes that look as if she has something prophetic to say. She has clear likes and dislikes. For example, she loves to touch hands, fingers, facial hair, or just about anything else you keep close to her. She enjoys lots of stimulation and can get easily bored when there's not much going on around her. She recognizes faces and people and will smile to let you know. She loves her brothers greeting her in the morning and LOVES to watch them play together. She's extremely content lying next to them just attentive. She is so joyful and rarely cries and then it's for a specific reason, to be held, moved, changed or something like that. The Nitric Oxide set up. Dum dum dummm. See why it's taken me SO long to write this up?? It's A LOT of information and we were slammed with lots over the course of two weeks. But now you are caught up to date with all of Everly's medical stuff for the most part. There's always more but that's another message on another day. Thank you everyone for lifting us up in prayer and specifically for lifting Everly's name up for healing. This has been a very difficult time on the whole family. Here's to looking at 2015 with good health for all! Before I forget, please pray for our whole family that we don't get sick because then we would have to stay away and that would be hard, too. Just a real quick update to let you know that we are back in PICU. I know some of you aren't on Facebook and might not have seen the news about it. She's been sick since Monday with nasty congestion. Took her to doctor on Wednesday to see what's going on and it sounded like it was all in her upper airway, not lungs. Continued with chest PT and xoponex at home. But Friday morning she wouldn't wake and when I tried to wake her she was not responsive. Her eyes were open but they were glossy and staring into space. Her numbers looked fine but she did not. Made the decision to call EMS. Upon arrival, they agreed her demeanor was questionable based on what I described as her baseline. So off to St. Joe's we went. There's a feeling this retention of gas was what was causing her to be lethargic and have drops in her heart rate. A thought is that the congestion is some virus causing the retention as well. So, while intubation was tossed around as an option, the decision was made to go from high flow cannula to bipap to allow her time to rest and help her expel the co2. She's been on it all night now and is doing well with it. Only a couple bradycardia episodes and seemingly holding steady. Waiting for new x rays, doctor rounds and setting adjustments. I'll touch back base when I'm able and have more information. We would appreciate and thank you for your prayers for Everly. For strength, God's healing hand, peace and calmness in decision making and in this situation. Thank you to Tiny Superheroes for the cape we have in Everly's PICU room. It came in the mail last week and is the perfect sentiment for her! I know many of you know the events of the last few weeks but there are some who aren't on Facebook which is where I update daily. So much has happened this month that I'm going to do a quick timeline for time's sake. 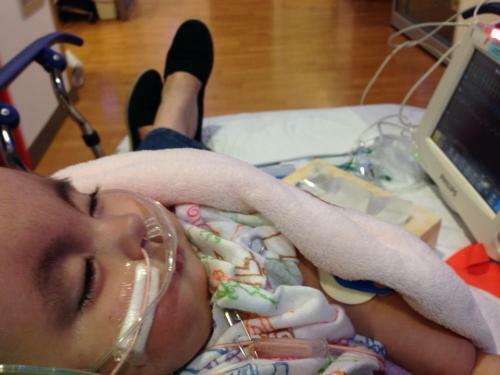 We are currently in the Pediatric Intensive Care Unit at St. Joseph's Hospital. Nov. 10: Everly wasn't feeling or acting great so we took her in to see Dr. Graham. Advised that it was probably a virus and we would watch it during the week. Nov. 11-12: She acted okay, not great but better than Monday. Nov. 13: She seemed to be worse so took her back in to Dr. Graham. Pneumonia :-( Shot of Rocephin antibiotic. Nov. 14: Okay during the day but that evening she began to and she became extremely lethargic with a low-grade temperature. Headed back in to Dr. Graham's office. Double pneumonia. :-( :-( Another shot of Rocephin. Her appearance was concerning to say the least. 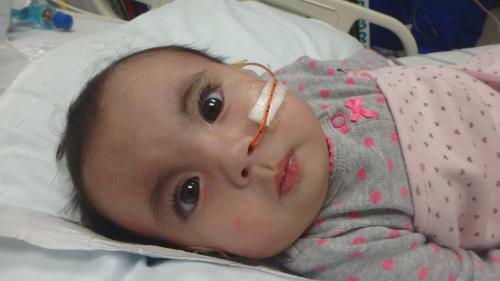 When asked about Everly's condition, Dr. Graham quietly said that Everly might not come out of this. That jarred us to the core. We went home, spoke as a family and decided we would take her into the emergency room. If you recall, we had always said no hospital and no 911 as well. However, since turning 6 months, we felt that maybe we needed to follow her lead, so we did ultimately decide to take her to the ER. *I did speak to our friend Beth and my best friend's husband to get their take on whether we should proceed with the ER visit. Nov. 18: Released from hospital but Everly's lung was still collapsed and she still had some congestion so we were to continue the chest PT at home. Nov. 26: Noticeably different with a deep cough, lethargic and marked difference in her appearance. Dr. Bash, the hospice doctor, prescribed breathing treatments and steroids to help clear her up. Nov. 27 (Thanksgiving): Everly had a rough night the evening before of crying and just being uncomfortable. Early that morning, her heart rate dropped quickly to 50 and remained. Her face was white and her lips cold to the touch. We called 911 and within minutes the EMTs arrived. She was able to recover herself without any intervention from them but it was necessary to still transport her to the ER via ambulance. 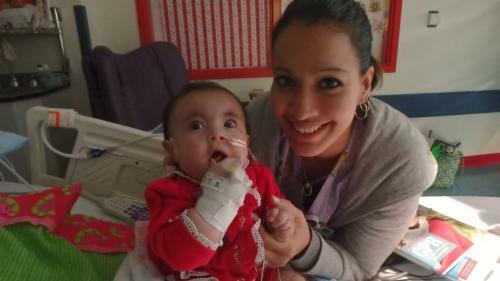 Once there, she was admitted to the hospital and moved to the Pediatric Cardiac Intensive Care Unit. 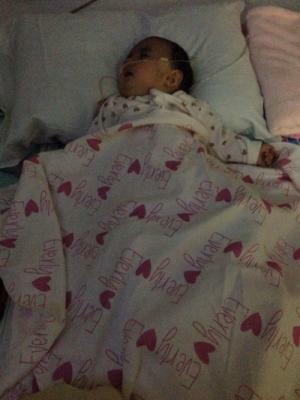 We are currently still at St. Joseph's Hospital with Everly still trying to fully recover. It's been almost one month now since she started acting not herself and exhibiting cold-like symptoms. We are cautiously optimistic for the all clear soon! In my next, I will address the diagnosis, treatments and plan of action for the future. I really wanted in this one to record the sequence of events, not only for my own preservation, but for anyone who does not follow Facebook, know how we got to where we are now and what is to come. Thank you for continuing to follow and pray for our Everly! Every prayer is heard by our Heavenly Father, the Great Physician. He knows all things and has plans for us but He also listens to us. If you are so inclined, we would ask that you continue to pray for complete healing of her little body, discernment on our part in decision making and compassion and wise judgement for the physicians. Please continue to keep in mind our sweet friend Elizabeth Maxine in Texas. 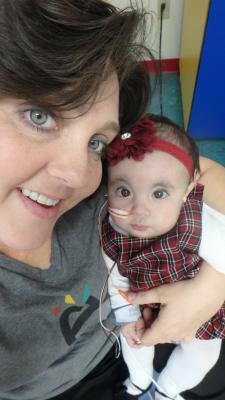 She will be 7 months old soon and is also beating the odds in Trisomy 18! Let's lift her name up and and pray for her continued good health and that of her family who embrace and love on her. A special shout out to Aunt Bees who has enough love to cover both sweet babies and more! We love you Scholes Family and Aunt Bees! Our God has kept us grounded and focused on Him even through this particularly scary time. He is faithful and His love never fails. We are so grateful for His promises and His presence in our lives and especially keeping Everly in His hands.